I got this bracelet for Christmas off my Grandparents and I was so shocked when I opened it! I'm so happy with it. 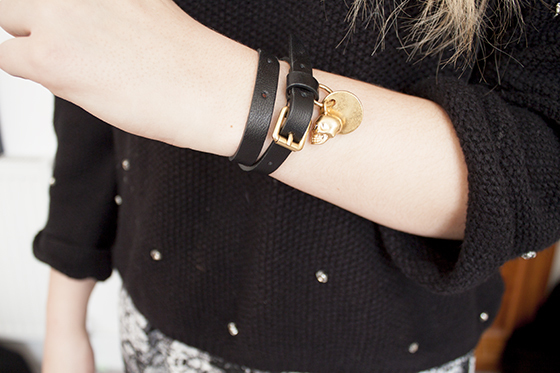 Absolutely stunning black leather bracelet with a gold jewelled skull decoration. It's super simple but a real statement and it's so nice to own something McQueen for the first time. I've always been a huge Alexander McQueen fan and his death was so tragic for the British Fashion industry. I'm so jealous! I love McQueen and searched desperately for the silver version for Christmas but it was completely sold out. I have recently heard about him mistreating interns and staff though which has made me think differently about him as a person, love his stuff though! This is so gorgeous! Lucky girl! I love Alexander McQueen and have been growing quite a collection of his scarfs but don't have any of his jewellery. This bracelet is so nice! I love Alexander McQueen, I don't think the designs have been the same since his death. You have some awesome grandparents Lily! Your grandparents must be so cool! Mine would never buy anything with a skull. :) Great bracelet, no doubt. This bracelet is really beautiful !! I love these kinds of bracelet! You're really lucky of owning a really nice one!! The bracelet's so cute! I know what you mean about McQueen being a tragic loss to the fashion industry. Thought the link would actually be to where we could get our hands on one though, Skimlinks is so annoying! I can't believe your grandparents got this for you! Awesome bracelet that the girl wearing.. Pink With Crystals is crafted from quality 316L surgical grade stainless steel. Click here to know more about Pink Bracelet.